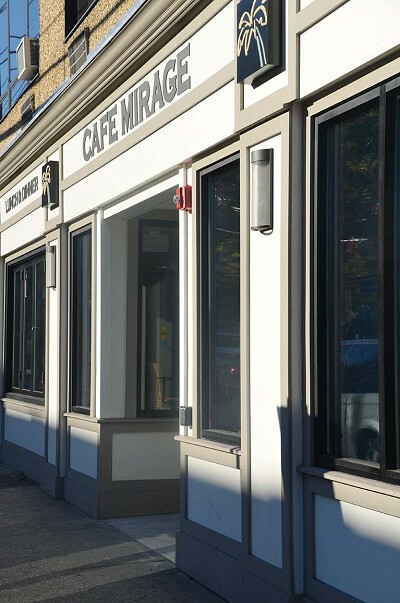 Café Mirage is expected to open within the next two weeks at 223-225 Westchester Ave.
Café Mirage will be opening in a week or two at its new 223-225 Westchester Ave. location, according to co-owner Katy Haggerty, whom I spotted outside the building last week. Everything is complete save the banquet room, but she and husband Dave, the chef, and third partner Ben Houx, who will be the general manager and banquet manager, are now going through the process of village inspections to make sure everything meets code. Piero's Italian Restaurant closed at the end of August at 44 South Regent St. after a long ride at that Port Chester location. According to their website, it is now open at 123 Halstead Ave. in Harrison where Halstead Avenue Bistro used to be. The owners, Peter and André Rosaspina, sons of now-retired Piero Rosaspina, for whom the restaurant is named, have kept the same name and phone number. They chose this space in Harrison because it is similar in size to their old place, but the bar is nicer.